A little over a month ago, I took a look at 32 different players across the NFL as they got set to embark on training camps across the country. The goal was to feature players with the most to prove, the most room to go up/down ADP wise, and the players involved in the most intriguing camp battles. Today, we’re taking a look back at 16 of those players to see where they’re at now. Below is the NFC training camp watch list; Sunday we tackled the AFC. For some of these players, not much has changed. For others, the light bulb came on or slowly dimmed out entirely. Gallup remains the most-owned player in my offseason draft portfolio. After catching a touchdown pass from Dak Prescott and continuing to see run with the first-team offense throughout training camp, Gallup has gone from last-round pick and $1 auction buy to a highly targeted mid- to late-round target and someone you might be forced into a mini-bidding war over in your auction. If you needed further proof the Cowboys have big plans for him, Gallup played just eight snaps in the regular season dress rehearsal. Manning saw his first extended action of the preseason in the regular-season dress rehearsal without Odell Beckham Jr. or Saquon Barkley on the field. He completed 17-of-23 passes for 188 passing yards with two credited drops (both to stop drives on third downs). Manning looked more comfortable than he has been in quite some time while operating out of a play-action based passing game with a heavy usage of intermediate over routes and the occasional deep shot. What a difference an offensive scheme can make and there’s strong evidence to believe this will be the case for Manning in 2018. His ADP hasn’t moved much and he remains a favorite target in 2QB leagues. When rumors flared across social media suggesting Doctson’s training camp injury was more severe than it was — with mention of him needing to get his ankle drained — there was some panic. It turned out he was fine and just nursing a minor shoulder injury. No targets in the final preseason game looked worse than it actually was as the Redskins leaned heavily on Adrian Peterson via the run. With potential to emerge as the clear-cut red-zone favorite in a proven offensive scheme like Jay Gruden’s, Doctson remains an excellent wide receiver flier. Ajayi’s ADP has remained stagnant this preseason, which is surprising considering he has missed time with an undisclosed and somewhat mysterious lower-body injury. Given Ajayi’s injury history — a knee condition caused his stock to slide all the way until the fifth round of the 2015 NFL Draft — it appears there should be more concern over a lower body injury than we’ve so far seen. The bigger concern remains Ajayi’s true role in the offense, in the red zone, and in the passing game. At his ADP, he provides upside in this offensive scheme (and behind this offensive line), but his floor makes him less of a preferred target. It has been a quiet preseason for Montgomery. His ADP has dropped slightly, but mostly due to what is going on around him. When Packers head coach Mike McCarthy gushes about Jamaal Williams as a breakout player poised to have a big year, it sends ripples across the entire draft landscape. Williams continues to be our back of choice, but Montgomery has “Duke Johnson in 2017”-like upside if the Packers fall behind in games, and even if they don’t, his pass-game volume will keep him worthy of a bench spot on any roster. Cohen’s ADP also hasn’t seen a major spike, which just means Matt Nagy hasn’t reference him in the same sentence as Tyreek Hill since he first did this past spring. Beat reporters say Cohen should be listed as a receiver/running back “slash” on the roster and that should be news to fantasy owners’ ears. Like we said a month ago when discussing Cohen, we’ll need to see his role away from the running back position grow to have faith in him. That’s what we’ve seen in training camp and Cohen is one of our favorite mid-round targets. It has been quite an interesting August for Johnson’s fantasy stock. In the first preseason game, Johnson strung together two of the best plays in space by any running back on the field that week of the preseason. Since then, Johnson has seen Ameer Abdullah and LeGarrette Blount take on a solid chunk of first-team snaps in training camp practices and the preseason. 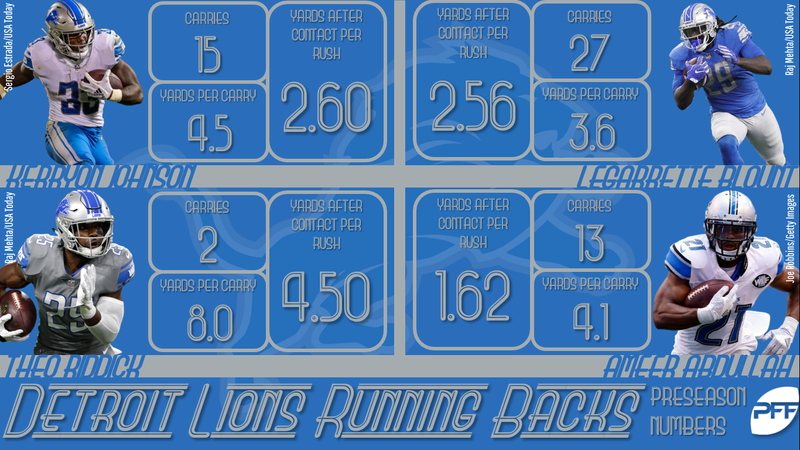 Theo Riddick also continues to get work with Matthew Stafford’s unit. Johnson’s ADP hasn’t quite dropped since the initial massive spike, and while we do believe that talent wins out, this is going to be a difficult situation to find consistent volume in with a head coach (Matt Patricia) who hails from the Bill Belichick school of multi-back offenses. Our concern at the start of August for Thielen was the change at quarterback. In 2017, Case Keenum and Thielen developed an incredible rapport to the point where he saw 41 more targets (135 to 94) than Stefon Diggs. One key factor in this development was Thielen’s usage in the offensive scheme as the primary slot receiver. With a new offensive scheme and quarterback in place with John DeFilippo and Kirk Cousins, his role seemed uncertain making him at least somewhat risky given his lofty ADP. Since then, Thielen has dealt with minor back and leg injuries in an otherwise disappointing preseason. At this point, his ADP is starting to fall as Diggs’ rise, so yes, he’s back on my radar. The fantasy value landscape is always changing with so many moving parts in play. As we first touched on back before camp started, Funchess played a much bigger role in the Panthers offense down the stretch, specifically on third downs. While his largely quiet August didn’t exactly align with general manager Marty Hurney’s declaration that he was just scratching the surface, you can do much worse with your mid-round flier pick at wide receiver given his red-zone role and Cam Netwon’s trust in him in contested-catch situations. Has anyone seen their fantasy stock change more than Jones’ fell this preseason? Jones finished his preseason with 22 yards rushing on 28 carries. Things got uglier when Buccaneers running backs coach said “there was probably a reason” Jones wasn’t used in the passing game at USC after observing his struggles transitioning to the team’s passing game at the NFL level. Putting the bow on things was head coach Dirk Koetter definitively referring to Peyton Barber as his starter and saying Jones’ preseason “wasn’t pretty.” It could take some time to hit, and you’re best off buying in leagues with deep benches, but Jones’ slide in live drafts is starting to make him look like an obvious buy when you’re deciding between the likes of him and the Giovani Bernards of the world. Hooper scored a touchdown in his first preseason game, but he was once again barely involved in the offense the rest of the preseason despite the absence of Julio Jones. Remember, Hooper also scored a touchdown in his first regular-season game last year before falling out of fantasy relevance. With the emergence of rookie first-round wide receiver Calvin Ridley in the preseason, it’s starting to look like another disappointing season for Hooper from a volume standpoint. You can do better with your tight end flier. It won’t definitely happen in 2018, but Smith is going to be a major fantasy factor some point soon. The explosive third-round draft pick followed up an impressive set of spring OTAs by constantly finding himself as the standout player at training camp — even earning reps with Drew Brees’ unit. Smith followed it up with an essentially dominant preseason that included multiple big plays. It has been a steady drum beat for Smith who you can still find on waivers in most of your league. Smith is only advised in deep leagues for now, but he’s definitely someone who should be near the top of your free agent watch list. Everything abrutply changed when McKinnon made his way back on to the practice field Saturday and tore his ACL on a non-contact play. Considering how heavily involved Carlos Hyde was in the 49ers passing game last year, there is plenty of opportunity for Matt Breida to now emerge as a rock-solid RB2 if he can take step forward as a receiver in the pass game. In addition, Alfred Morris is back from the fantasy football crypt and should be selected in the Adrian Peterson range of your drafts due to his fit in Kyle Shanahan’s blocking scheme and what he showed as a runner during the preseason. Lockett was finally 100 percent healthy entering camp and it showed with him constantly making standout practice report lists before a minor toe injury in mid-August. With Doug Baldwin declaring that he will only play at between 80-85 percent this season, and with Lockett signing a long-term contract extension, his ADP is on a steady rise. However, we still feel like he can return value even if you can no longer get him for a couple bucks at the end of your auction given his upside from both a talent and volume standpoint. Remember, in addition to Baldwin’s injury, the Seahawks lost a whole lot of targets with the departures of Paul Richardson and Jimmy Graham. Head coach Sean McVay paid a big price for Cooks (a first-round pick and a massive contract extension) and then decided to put him in bubble wrap. Cooks didn’t play a single preseason snap. The Rams starters overall were mostly on the sidelines for the preseason games as McVay changed the game. For Cooks, his ADP has subsequently remained stagnant with many owners passing on him after simply applying the logic that he will follow a similar path to volume as Sammy Watkins did with the Rams in 2017. Considering the steep price the franchise paid to get Cooks versus what they gave up for Watkins, this logic could very easily prove wrong. Seals-Jones had an extremely quiet August following his mid-July arrest. The converted wide receiver is expected to play a bigger role than expected with a quarterback who has traditionally targeted tight ends and among an uncertain group at wide receiver, but we wouldn’t know it from the preseason. Given Seals-Jones’ efficiency on an admittedly small sample size in 2017 combined with the factors we mentioned above, you can do a lot worse with your TE flier than Seals-Jones.